3rd Edition of this popular kit. 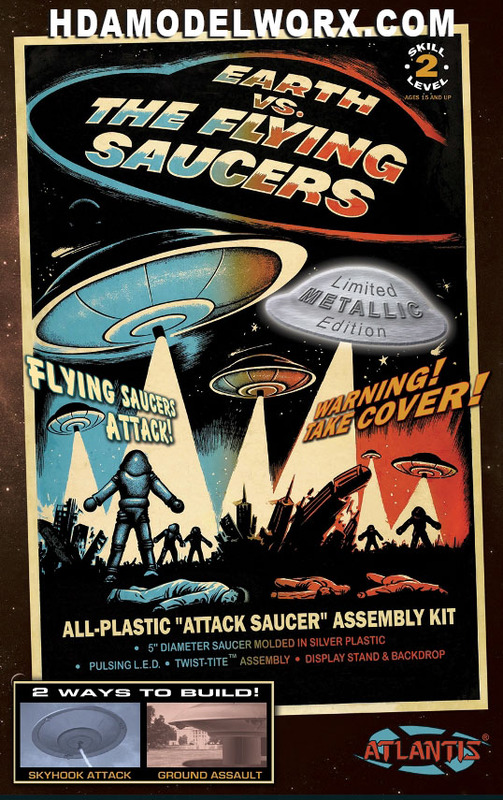 It's the relentless Attack saucer designed by Legendary effects Master Ray Harryhausen. The model features our Twist-Tite Technology. The kit assembles in Minutes, ready for display. No glue needed. Speaking of display, a card stock backdrop display is included with all new graphics! Kit includes a ready to use LED Light with batteries, Cardstock Backdrop. Injection molded in Metallic Silver highly detailed Polystyrene. Kit can be assembled as Ground Assault or Skyhook Attack mode. Skill level 2. Easy assembly. New Box art!